Hurricane Katrina struck the Gulf Coast in August 2005, flooding the city of New Orleans and surrounding areas, causing billions of dollars worth of damage and killing over 1, 8oo people. Since that tragedy, writers have plunged into this dark part of American history, exploring the politics and people involved with this catastrophe. How often to we insist that it is the job for poets to bear witness to the truth? 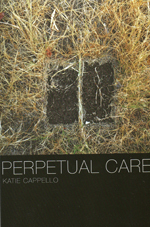 The truth, of course, is always subjective, but both Patricia Smith in Blood Dazzler and Katie Cappello in Perpetual Care come close. snippets of filth music, cars on collapsed veins. The whole gray of doubt slithers on solemn skin. all I’ve ever been is starving, fluid, and noise. open wide my solo swallowing eye. and lifting souls up to feed your ravenous eye. I asked my boy, and all he says is Wait. I believe him when he says helps goin to come. Smith’s collection is brutal and honest, focusing on the human element of the natural disaster. It would be too easy to simply focus on the political aspects of the disaster; instead, she renders the stories of the storm, both human and natural. like the inside of organs. pale pink and drained of blood. as they took photos, gathered bits of fiber. in the shade of the bottle tree roots. Is this the birth of a new world, or simply a rebirth of a devastated world? Or, is there really a difference? The opening is not clear, although through the poems that follow we see a narrator traveling through a devastated South. Unlike Smith’s collection, not every poem in Cappello’s book is specifically about New Orleans, but still the near death of this city is never really far from the narrator’s mind no matter what experiences she records. For example, in “The Bedtime Story” the narrator states, “My father says we will watch the world end/from the football bleachers/grasshoppers rising from the thirty yard line/noted legs, eyes like negatives.” Such details render a sort of the end of the world fairytale, filled with both wonderment and destruction. This juxtaposition can be seen in many of Cappello’s poems, where we see a destroyed city and the hope found within its carnage. struggled, leaking dog out into the street. just threw him into the trash to swell and rot. Realize this is why you left. What can be learned from these two poets, or any poet for that matter, who writes about tragedy? We know, of course, that words cannot erase the past. But we also know that words can help remember the past, cite the wrongdoings and provide hope for the future. Both Smith and Cappello reach for these lofty goals, and surpass them. Karen Weyant‘s most recent poems have been published or are forthcoming in 5AM, The Barn Owl Review, Copper Nickel, Innisfree and Lake Effect. Her chapbook, Stealing Dust, was recently released by Finishing Line Press. Visit her blog.